'The Cottage' is directly on the Long Island Sound, Stamford Harbor and has spectacular views with beautiful sunrises and view of the Stamford Lighthouse. It is a 1950's updated and remodeled open floor plan home. The backyard lawn meets a rocky shore with a path down to the water and small beach. Within 1400sq ft are 3 bedrooms, one bathroom with double sink and open LR, DR and kitchen. Home has been upgraded to accommodate discerning guests with amenities including high quality sheets, towels, varied down pillow options, free wifi, Sonos, Nespresso machine and more. "Sustainable and Green" design was chosen when possible. In season guests can paddle board, kayak and swim. Location is a nice walk or bike into town where the shops and restaurants are the perfect accent to our coastal community. Todd's Point is a sandy beach and nature preserve that is a short drive, run or bike ride away. Other attractions include Downtown Stamford, Greenwich Avenue, Bruce Museum and train or drive into NYC within 1 hour. 'The Cottage' is nestled between 2 beautiful stately homes but still maintains privacy and is loved by all who have stayed there. Use of dock and mooring is available at special request. Pets are discouraged but will be considered. Long term stays are possible. World Traveler who loves to come home to this beautiful piece of paradise. We live in a neighboring home with the same incredible sunrises and salty fresh air. This property is on one of the prettiest streets in Old Greenwich. People often walk their dogs, jog or stroll on our lane. Some of the homes have been here for over 100 years, while others are newer. Tomac Cove which is a stones throw from 'The Cottage' has claim as one of the landing spots for the Pilgrims. Wildlife abounds with Egrets, Blue Herons, Geese, Ducks, Ospreys, Hawks and more. Anya Seton, a prolific author, best known for her books turned Hollywood movies, DRAGONWYCK and FOXFIRE, lived in a home on this property. Her book THE WINTHROP WOMEN is a historical fiction novel that takes place right here in Old Greenwich and Tomac Cove- a great read. On the water! Views! Water bird viewing! Sunrises! Light House. Stamford Harbor. Beautiful skies. Casual fishing. Serenity. Please inquire for longer term rentals. toilet, shower, Double sink. Two faucets. Great towels. Hair dryer, soaps. Property is located biking and walking distance to Old Greenwich downtown and Todd's Point. We have a small rocky beach. Great place with younger kids to explore for sea glass, small sea life and shells. Property is NOT on the ocean but on The Long Island Sound- a large body of water connected to the Atlantic Ocean. 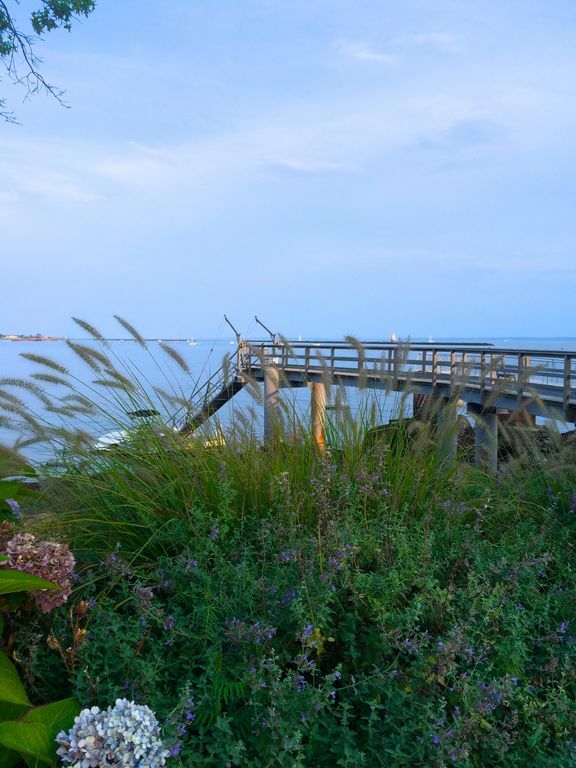 Property is directly on Long Island Sound. The beauty is in the open space, light, sunrises. Swimming and use of Kayaks and Paddle Boards is available. Game table- chess, backgammon, checkers. TV, Sonos, View of Long Island Sound. Large Table- can easily seat 10 guests. 4-5 Kayaks, 2 paddle boards- on request- but easy to provide. If renter has boat- please call to discuss mooring or docking options. casual seating and bistro chair and table. Old Greenwich is a great spot to get away from NYC, use as base camp for searching for a new home, visit family and friends in vicinity or to try out living in this part of town. OG is a few miles to Downtown Stamford or Downtown Greenwich. Great spot for long weekends- enjoy local flavor for Memorial Day Parade, Halloween, Easter, Christmas, and fabulous fireworks for 4th of July. We had a lovely stay in this updated 1950s cottage, located in a beautiful neighborhood in Old Greenwich. We spent the Christmas holiday here, as my family lives nearby. The views of the water from the living dining room are fantastic. The cottage is very nicely decorated and very comfortable for a family to relax in. Our daughter and her husband stayed in the twin bedroom and were delighted with the space. We stayed in the master bedroom with the king bed. Both rooms are quite large with extremely comfortable beds and ample storage. Between the rooms is a very nice bathroom with a shower and a double sink. The third bedroom is very small and cozy with a single twin bed. Our youngest adult daughter stayed here. It is like an efficient room on a boat, which fit the nautical theme of the cottage. The kitchen is fully equipped. We cooked great breakfasts every day. Our other meals were at my family’s home. The linens were of high quality with duvets on each bed. It was a beautiful retreat from the hectic bustle of our large extended family. This location is close to downtown Old Greenwich. It is easy to shop at the local grocery store, or to take a commuter train into New York City. We saw a Broadway play one evening. Our host was friendly and easy to communicate with. She lives in the adjacent main home. They were out of town during our stay, so we never actually met. There is a long dock out into the water which was fun to explore. The surrounding yard and patio was very private and well landscaped. As it was late December and winter, we did not spend very much time outside. We would love to return, especially in warmer weather. I am glad you and your family felt the care and thought that goes into creating an inviting space for our guests, The Cottage is a special spot! We welcome you back in warmer weather!! Kayaks await you! Our family of 2 adults and 2-7year olds took over the cottage to visit Greenwich and to host Thanksgiving dinner! Everything worked perfectly, even in 15 degree weather! The kids played on the beach, walked the neighborhood, the cottage had everything to make myself a morning latte or a cup of coffee! The whole week was heavenly! Thank you and we will be back! It was a pleasure having you and your family! Thank you for the very kind review. We look forward to a return visit! We really enjoyed staying at the "Cottage". The location on the water was great, close to town. Furnished well, think hotel suite. The owners were very helpful hosts. Made for a very easy weekend away from the city. We would definitely stay here again. The Cottage was perfect for our family of five during our spring break east coast college touring . We are frequent VRBO users and found this property to be among the best of our experiences. Everything was meticulously maintained. The furnishings and finishes were tasteful. The beds were really comfortable and there were so many thoughtful details ... ample high quality towels, treats upon arrival, super soft linens, scissors, lighter, equipped kitchen... The property is located in a beautiful neighborhood of waterfront homes near many restauarants and services.. NYC is a 40minute train ride away and I95 is minutes away to take you anywhere along th eastern seaboard. This is definitely a property where the pictures don’t do it justice. The interior is light and sleek, and the views are beautiful. The only drawback is the one bathroom. But it is lovely and even with our sizeable family, we made it work. The Cottage is our all-time favorite rental! It is better than the description and the owners could not be nicer! Perfect location—you can walk to charming downtown Old Greenwich or stay at The Cottage and watch the sailboats on Long Island Sound. Beautifully landscaped, clean, new and contemporary with every amenity. Highly recommend it!! Adorable cottage in a great town! We loved our stay here! This is a New England style cottage in a fantastic town with friendly people. The downtown of Old Greenwich and the train station is easily accessible from the cottage. The owners welcomed us when we first arrived and even showed our children things to do on the property like collecting sea glass! They were always a call away and immediately responsive to any questions we had though never intrusive. Even providing me with a list of things to do in the area like shops and places to take our children. The view from the back is beautiful and we spend many mornings and evenings opening all the curtains to take advantage of that view. You are right on the Long Island Sound! We did get to see a gorgeous sunrise on several mornings while drinking our coffee. The cottage has all the amenities you need - plus the cooking and entertaining essentials. Soft towels and bedding and all the personal touches of a bed and breakfast. We hosted a Thanksgiving dinner here and everyone commented on how cozy and comfortable it was! Wonderful stay and will love to return one day again! Binney Lane is lovely tree lined lane. 'The Cottage' looks out onto Stamford Harbor and Stamford Lighthouse. We can talk by phone to go over any details. Please email me and we can arrange to talk.